I often get asked to share what the best WordPress themes for creating a niche site that gets great adsense click through rates (CTRs). I usually try to explain that Click through rate (CTR) is less about the theme typically and more about the Google Adsense Placement (or other monetization ads) and less about the theme. Yes, some themes have the Adsense placement built in, but using plugins and widgets you can essentially put Adsense ads anywhere you want on your site no matter what theme you are using or type of blog you have. 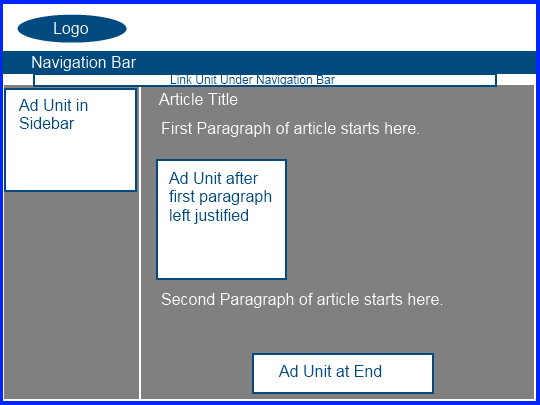 (If you want to know how to insert link units under the navigation bar – watch my video post here). 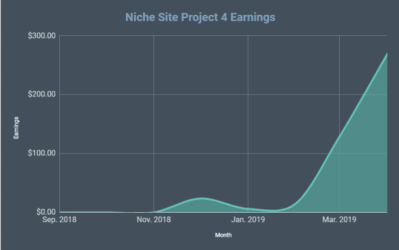 This is why I tell people that I literally try to use a different theme for almost all of my niche sites – because I can place the Adsense ads where I want theme very quickly and easily no matter what the theme is. In addition, using a new theme for each site helps them look more original. You may also want to consider Elegant Themes, see my review here. So, in my opinion, much more important that knowing the “best Adsense themes” is knowing the PRINCIPLES of where to place your ads. I am going to show you 5 quick examples of some different adsense layouts that I have used in the past. But even more important than that is to try and understand WHY I put the ads where they are. Then you can literally come up with hundreds of different ad placements, sizes, colors, or other combinations to create your own unique sites and ad placement. In a nutshell, here are the principles that you need to consider when you are trying to optimize your CTR. Knowing where visitors tend look first on your sites can help you determine where to place ads to get the most attention (if that's what you are going for of course). You can find all sorts of “heatmaps” that show you where users look first of spend most of their time on sites. From looking at these and from my experience, I would say that users tend to look first at the Top Left part of the page (probably because we are all trained to read the text of a book from the top left and then move down). In addition, big bolded items such as post titles also get attention. Finally, navigation bars at the top or in the sidebars are also used frequently by people because this is how a traditional site is set up. Okay, now that you have the principles of where you should be placing Ads for maximum Click through rate, I want to give you some specific adsense layout examples. This is an extremely aggressive adsense layout. I personally don't use this layout, but I expect it would get an extremely good CTR. 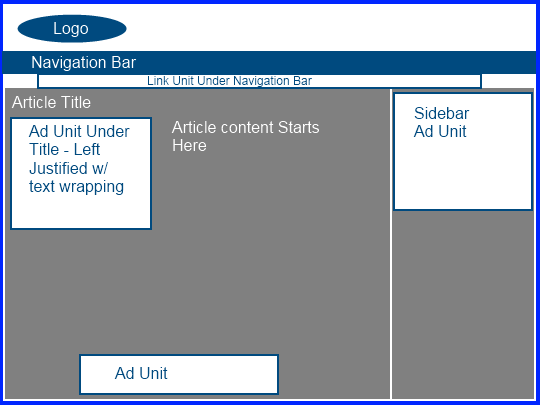 In addition, I want to point out that another popular layout is one that removes Ad Unit #2. I often see adsense sites with what is shown above minus ad unit #2 – still agressive, but slightly less so. This is an interesting ad layout because it is set up to display the ads after the first paragraph of the article. So, this is less aggressive than layout 3 for example, but would still get a very good CTR because the ads are still above the fold, in the content, and left justified. Overall, its still obviously an aggressive ad layout but is certainly still within Google's TOS. I literally could have created probably a hundred different layouts of potential places to insert ad units. I could have created a layout with 2 sidebars with one on the left and one on the right. I could have given examples of 2 sidebars both on the same side (either right or left); or lots of other site structures. Then obviously there are hundreds of combinations of ad sizes, exact placement, and options of using 1, 2, or 3 units in the content. Hopefully these 5 simple ad layout examples will allow you to come up with your own based on the principles I have discussed here. I also want to point out that you don't have to use Link units on all your sites under the navigation bar – I just showed that here because it was easier. If you are not comfortable doing that – then don't! Or if you want to use MORE link units than I showed here either in the sidebar or in the content, then by all means go right ahead. Just be sure to read up on Google's policies for the total number of ad units that you are allowed to use. Overall, the purpose here was to show you a few layouts that will get good click through rates. 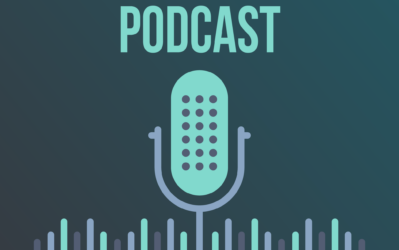 Most importantly, you need to consider what the strategy or YOUR business is and whether or not a more or less aggressive ad layout is more appropriate. I am interested in hearing what you have to say about these 5 simple layouts. Are any of these ad layouts that you have used in the past or would consider using on your sites? What additional thoughts do you have to add about getting optimal click through rates? Hey Spencer, thanks for sharing. I was under the impression that AdSense rules allow no more than 3 ad units per page. I noticed the layouts where you’ve included link units below the navigation also have 3 other ad units which totals to four. Is there a distinction between link units and ad units in AdSense rules? Please let me know, thanks again for the article! 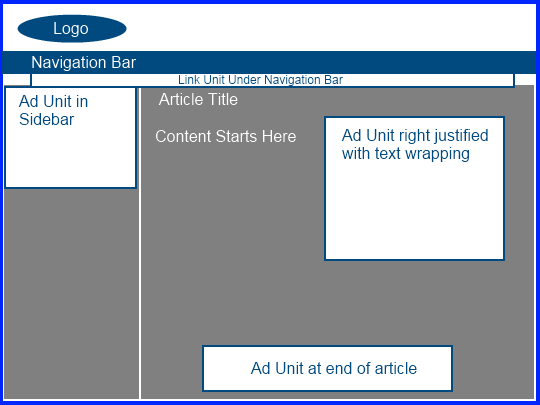 Links Units are counted separately from Ad Units. Here is the answer to your question from Google: http://www.google.com/adsense/support/bin/answer.py?hl=en&answer=9735 . 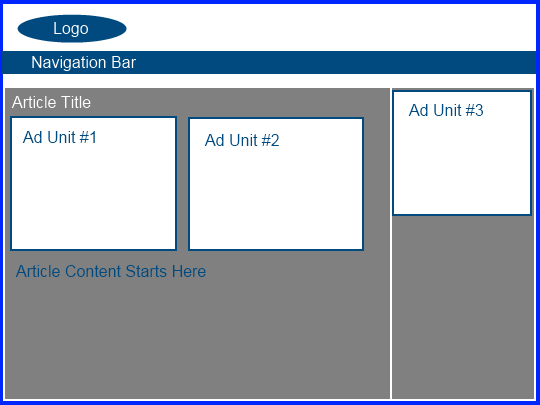 You can have 3 ad units, PLUS 3 link units, PLUS 2 search box units. 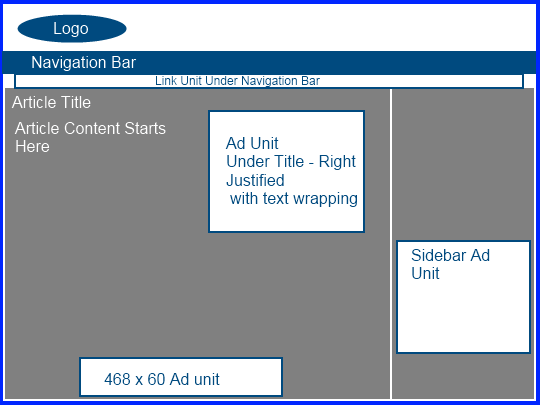 So you can have many more ad units than what I have shown above. Layout 2 works perfectly. I personally tried it and got god result. One thing I’d like to point out is the leadeboard 728×90 ad unit. This ad unit when placed just below the blog title can increase your CTR and earnings dramatically. Spencer I suggest you to try this and let us know your results. You are right Vijay! I didn’t show any examples with the 728×90 unit. I have tried it on a few sites and it does perform well. I think experimentation is the key… I will have to try it again as its been a few months since I’ve used this unit. Thanks for the suggestion. I just stuck a 728×90 above my main navigation but below my blog title on one of my newer niche sites. Interested to see if it increases ctr. Great post and layout examples! I usually tend to stick with something similar to Ad layout #3 (minus the use of either Ad Unit #1 or #2). Seems to be the best one thus far. One thing I’ve noticed is that the more I optimize my content around my keyword(s), the better my CTR usually is (due to better ad targeting). I definitely still feel that certain layouts will attract the eyeballs to those ads, but the better targeted your ads are from proper site optimization, the better the CTR. What do you think? Great point Bryan – I think optimization around a keyword is critical. I agree that even with optimal adsense placement – if the ads aren’t targeted then CTRs will not be as good. Thanks for sharing all the very cool layouts. I would have to tend to agree with you that is has very little to do with the actual WordPress theme and has everything to do with the style of the adsense block and the positioning of that block. I play with mine once in awhile when I am getting good traffic to my sites. But initially I just put them in the proven best spots and keep them put until more traffic comes in. Sounds great Michael! I agree – its more about the layouts than the themes themselves. Thanks again Spencer for very useful insights since i have not much tested adsense ads place as you are.So getting your advise it is always useful. I am just curious to know that are you using google analytics code and webmaster tools on your adsense sites?and if you are not using what are the alternatives you are using for google analytics.Since i am not using google analytics for my niches sites as google i do not like to give my sites ‘s data to google. I have tested woopra and statcounter.They are good but now as good as google analytics.Any suggestions for that ? You really don’t have a choice about giving your site data to Google. They are going to have it no matter even if you have Analytics and Webmaster tools on your site or not. They still can collect that information from your sites :). I personally use both those tools are they are awesome and give you all the information you need. 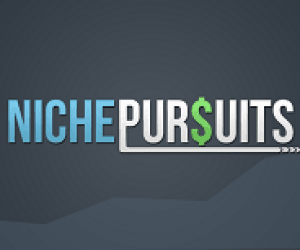 Plus using Webmaster tools helps me get my niche sites indexed much quicker. I do use Google analytics again. I stopped for a while and was using Piwik stats. Google analytics is easier to use. I don’t use webmaster tools at all anymore. Why don’t you use webmaster tools anymore? What do you use to get indexed now? Social bookmarking? Google is pretty good at indexing sites. I don’t do anything to get indexed, I just build the site and the go on to my regular link building. Google usually finds my sites before I even build links though. WordPress has a built in ping system that I assume is part of the reason finds sites so quickly. Getting indexed is a non-issue. This post came at a good time for me..just got two keywords for my first site ranked at #4 and #5 so far. As of yesterday getting about 65 unique visitors per day but not no clicks. Will wait a few days and start testing different things. Just added a link unit to the site, wasn’t sure how to do it manually with the editor so thanks for your video. Yeah, with 65 uniques a day you should be getting several clicks a day typically. Try out some new layouts and see if that helps. It’s crazy how you anticipate my “next” question with your posts man haha. 1. Is the reason you vary the theme from site to site to avoid potential problems during a manual review from a Google employee? 2. Doesn’t using a different theme affect scalability since you or your VA have to find a new one each time? 2. Do you use the same ad placement on all of your sites, and why or why not? Regarding question #3, I’ve been wondering whether you can generalize a layout and ad placement that gets a high CTR to every site in your portfolio. Let’s say you have a site that gets tons of traffic and clicks. You could split test the crap out of that site and have statistically significant data to back up your changes. Then you could make the same changes to your other sites but the question is, would the other sites respond equally well to the changes? I’m no statistician and I’ve been looking in earnest for an answer to this question because as we scale, that extra +2% CTR is serious money. 1. That is the exact reason. Perhaps google can detect this automatically as well? (not sure). 2. I have found a few good places (companies) that offer free themes. I trust my VA to find a good one. Also, not EVERY site is a different theme, there are a few repeats, but most are different. 3. I usually start with the same adsense placement as I have my VA insert my ads to start. Then if the site is earning well (or not) I may change ad layouts down the road to test things out. I agree that more and more tests will definitely help, but it may or may not be as equally effective on new sites. So many things come into play. But overall, its worth testing. Dean – I’m going to do a full post on this in the near future. I have found Adsense block 4 really useful for my sites. I will try working with several other blocks in my future projects to see how it turns out. I’ve been setting up separate ad units for each domain and labeling them ‘domain – sidebar’ ‘domain – post top’ etc. thinking that it will be better for tracking which sites and which ad units are performing best. Yes you can create one Google unit and use it on multiple sites. However as you mentioned its a bad idea to do this because then you don’t know which of your sites is performing. It is definitely much better to create a unique Google adsense unit for each site and attach a unique channel to each unit. That way you can measure the performance of all your sites. Yes it does … thank you, Michael. Glad to hear I’ve been doing it correctly. Actually Google automatically tracks which sites are sending the clicks and the earnings. You just go to the performance tab and clicks “sites”. So even if you use the same adsense code on all your sites, you can still get all the stats on which sites are sending the clicks. That is interesting, and explains why you cant combine channels no more and create a report..
Deb – sorry if I missed your question!! Yes, you can use the same ad code on multiple sites – I do this. 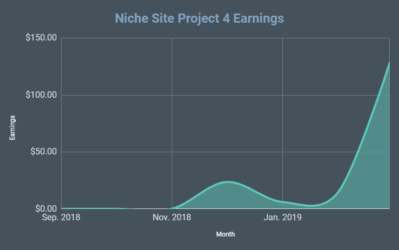 Google automatically tracks what site is getting the clicks (site performance reports), so it makes it very easy to see what’s bringing in the money. I could probably do better by setting up custom channels for additional testing, but I just use the site reports and then optimize the overall site by trying out different ads etc. The choice is yours, but you certainly don’t need to get new ad code for every site you do. Hey Spencer – thanks for your input. I guess I could do it your way but I think sticking to my works for me. Having custom channels for everything makes it clean for tracking purposes for me. Plus it only takes me 2 seconds to setup a new adsense block. Michael – custom channels are the optimal way to go for sure. Hey Spencer, thanks for this very useful post. I use layout 1 at most of my niche sites, but without ad unit at the bottom. Layout 2 is pretty interesting; I think I’ll try it. Thanks for the input Michael. I agree that the best thing to do is experiment with different layouts and use what works! Thank for awesome post Spencer! Do you use dome teasers around the ad units to increase CTR? Some arrows pointing to the ad unit or something llike that.. I wouldn’t do that. That is definitely against Google Adsense policy. You cannot entice your viewers to click on ads. I would stay very clear of that! Putting “teasers” or arrows around the ad units is potentially dangerous as it violates Google’s TOS! No, no, and NO!! This is a great way to lose all your money and get banned from Google Adsense in a heartbeat. This is strictly forbidden in the Google Adsense terms of service. If you are doing anything close to this, I recommend changing your sites before you get banned. In addition to optimized ad layouts I find that certain niches naturally tend to have a better CTR. This is especially true in case of finance, debt, mortgage or law related niches in my experience. Yup that is definitely Anshul and that is way keyword research is SOO important in the niche industry. Without the right keyword targeted your website is almost bound to fail. Spencer, do you do anything at all to spruce the sites up? Like custom headers, backgrounds etc – anything that goes beyond just pasting articles, ads and maybe some images. Great question. I personally put in custom headers, a video, and an image into every post if possible. I am thinking about possibly doing more but I guess that really depends on what Spencer has to say as he is the expert. May be a waste of my time. Sometimes. My sites start without anything fancy like headers etc. The sites that do better get headers or better themes, etc. Really you leave them 100% plain. That’s crazy. I guess I like to have a good looking site for no reason then besides personal preference. However it isn’t like I spend hours on end. Just like 10 to 20 minutes each. I think its a strategy issue. If your making predominately adsense sites. And you believe inthe volume appraoch and the subsequent understanding that a lot of sites simply fail or dont produce then investing in graphics from a time or cost basis is flawed. Its possibly better to build 20 sites and attempt to rank and then add graphics and more content to the one showing potential? and better along with better understanding of the potential income from a keyword. Im split testing 50/50 pretty against ugly. Same here, Michael. I have a basic template that I designed in Photoshop to use as a background image and then customize that with different colors and/or images for each site. I set up a layout in Thesis for my first site, so now I just copy the ‘custom’ folder over to each new site, change the image path in the custom css editor and set up a few of the design options. I can have a new site up with custom header in under 30 minutes. Nothing wrong with that Brian…do what works for you! 1) Following Brian’s comment, I’ve reas in several places that the highest paying ads are served in the first Adsense block of the page. Thus, wouldn’t be better to remove the link unit below the navbar so the 300×250 block (which I assume has the highest CTR) gets a higher CPC? 2) Do you use images in your homepage and in the rest of the pages? 3. YES! I link to big authoritative sites typically, like Wikipedia or sites in my niche as well – whatever is relevant. I’m not afraid of passing link juice. Outbound links are good for niche sites. Really great post, learned a lot from it just like your other posts. Your reply here for no. 3 is something quite new to me. Appreciate very much if you could elaborate a little more on why outbound links are actually good for niche sites. 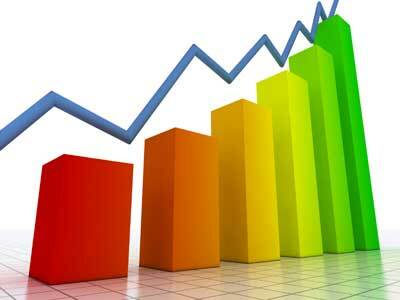 What benefit can it bring towards getting the site ranked better in the search engines? Real sites link to other sites. Its just natural. So if Google see absolutely no outbound links, then they would not see this as a normal site and actually could be one strike against you. However, on the other hand if you are linking to 100 sites from one page, then that’s not good either. There’s a way to put the 300px block first in the code for google but still display the ad units first, although it involves using CSS, which can be time consuming if you’re using different themes for each site. Interesting…what’s this business about Google delivering lower clicks? Does that mean lower paying? What do you mean by lower clicks Chris? Usually if you get less clicks you get less earnings. But not always necessarily true. Way back when. Two lines of thought were been touted..
a)Use only one ad block, this insured better paying ads. Neale – there is nothing wrong with doing only 1 ad, and in some cases may result in higher earnings. But what I’ve found is that in certainly industry there are lots of advertisers paying well – so even the ads that may pay the lowest on the page are still pretty good. And the additional ad units result in higher CTR. But you are correct that is some cases one unit might be better. Yeah, one format I like too is the link units right on top under the blog title with a nice table box wrapped around them to highlight them. Thanks for all the pics — I use a lot of left justified large rectangles, mostly under the post title. Interesting Spencer, we’re big proponents of layout #3 but honestly I am having trouble doing some real scientific analysis. There are just too many factors to consider, especially when you get into seasonal niches or fads. I am hoping with our extensive library to have more reliable numbers on this soon. I agree Joe. Its hard to do “real” scientific tests because there really are alot of factors that come into play. Overall though, I think the principles I outlined are a great starting point. But I know you like to do tests, so I’ll look forward to when you have some results to share! Thank you for your article and answering so many comments quickly! I have a few questions regarding ElegantThemes that you use on some of your websites (LongTailPro for example). As yourself I like aesthetically good looking websites. I bought the subscription for ElegantThemes and I like many of them though It looks like only 10-12 out of 85 or so are going to be useful for me. I know design and programming, so customizing is not a problem but I don’t want to spend hours on adjusting 12 themes if there are other alternatives that would work better in terms of SEO and loading speed. I know that Thesis is on the top of the list of many IM pros. 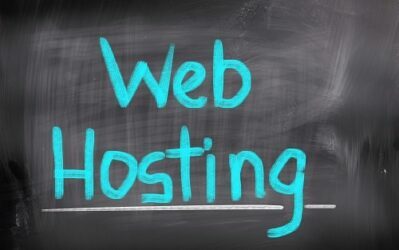 I have looked at it and it seems that you need to configure your theme for each new website manually because all settings are stored in the Database. There are also themes by ClickBump (WF). I like that they are very light and the author included speed installer. Visually they look OK but less impressive than ElegantThemes. I know that visual part is not that important for the vast majority of users. So, what is you take on ElegantThemes, Thesis, ClickBump and other ones? George – as you noticed I do like the Elegant Themes. I like the look for some of my bigger sites. Generally speaking I do not use Elegant themes for my niche sites however. I have been using very simple, free themes for my niche sites to start. If they start earning more money, I might spring for a more professional looking template. I have never used Thesis or ClickBump themes, so I don’t really have an opinion there. Except if you are considering Clickbump – why not just use a free theme? The themes from ClickBump that I’ve seen are no better and perhaps less visually appealing than lots of great free themes out there. wp clicks or click heat dynamo or other? Seems pretty cool since you can see a ‘video’ and red spots of where the user moved their mouse and clicked. And a summary of stats. Never used it, but sounds pretty interesting! an adsense site). I’m in positions 1 and 2 on lst page for some of my keywords but CTRs not good. I’ve had access to Adsense for six months now but never used it. I set up this site with an affiliate link on it. Yes, you can definitely use adsense ads in combination with your affiliate links on the same page. No issues there. So you use the same adsense code on every site, but change up your themes to dodge google? Seems a bit counter productive. The whole paranoia element of internet marketing is a bit funny at times. Not beating you up over it…. i’ve just always respected you over the other guys because you learn towards the white hat approach instead of the black hat stuff. It seems as though you would have nothing to worry about – who cares if you use the same theme on every site? Well, I guess I’ll find out if there’s an issue with using the same theme. I use Thesis for everything and just customize the header graphics. Have you ever run across a good thread somewhere on this whole issue of how to be stealthy towards Google and how important it is? If not you should start one here. This is a topic that might be critical for Adsense businesses because we are so completely at Googles mercy. Who wants to spend a year or more building hundreds of sites and then wake up with x percentage of them “turned off” because 1 isn’t liked by Google. A good starting point is the extreme, probably impractical position ie Google should never be able to associate more than one website with one “owner” even if you own 1000 Adsense sites. For brainstorming purposes we shouldnt assume this is impossible. BTW adsense sites are extreme examples but any SEO based business has similar exposure. Any thoughts anyone? What color are you all using for the text on your adsense ads ? I use Blue for the top text and the other text below it, I make black. I am also experimenting recently with a 468 x 15 unit either in the header section or at the top of each post. I make these have Red links (and not the usual blue). Having fairly good results so far with it. Anybody else use the 468 x 15 unit ? Yep, that is my standard for the most part. Blue links and black text. I have used the 468 x 15 units either at the top of a post or at the bottom. I actually use the 728×15 link unit so I can get more ads in. But my website is relatively wide so it works for me. I agree with Spencer that the blue works well as its the natural link color. You’ve been teasing us for ages! How bout some concrete examples of some of these free WP Themes you’ve hinted at that demonstrate these ad placements? I reckon it’d be great to debate the pro’s and con’s of each. This sounds like it would be a very useful post. Up until now I’ve built all my niche websites on one particular theme but switching it up from site to site may be fun and give a different look and feel for my sites. So, if your themes are all different, do you have to create different ad blocks (with different color links) to blend in with each theme? Or do you just use the default color provided by Adsense and place them on white colored background themes? Not usually, I tend to stick with blue title and black text for the most part. (I do change some of the ad units from time to time). And yes, the themes have white backgrounds. really like your blog! you are right about adsense – the placing makes the difference. i´ll experiment with your different layouts for sure! Another great post mate. I bought Joel Comm’s e-book “Adsense Secrets” in the past and he pretty much just fluffed out what you just gave us for free to 100 or so pages and mixed in a sales pitch or two. Loving the value you offer on this blog. Also, I’m curious as to why you would steer clear of a more aggressive layout if you believed it would get a higher CTR? Thanks Chris! The only reason I might steer away from a more aggressive ad placement is because of a potential manual review. I don’t know how often manual reviews are done, but in the odd case that it does happen a super aggressive ad placement might raise a red flag. I’m just erroring on the side of caution I suppose. Yeah, I’d also say that bounce rate will play a major impact post panda. If you go super aggressive with your layout, people may just see ads and click back immediately; leading to a high bounce rate, and a possible loss in SERPs. Having an option where they see content (even if ads are there) will mean they are more likely to stick around a while and read the page. I don’t know if this is true or not, but I recently read somewhere that google’s adjusted algorithm post panda factors in how much advertising is on each page and if it is loaded with ads, will negatively affect its rankings as will a poor bounce rate. This seems to make sense since Google’s primary purpose is focused on the users experience. Nobody wants to land on a page that has more advertising than useful information. I think bounce rate is probably factored in, that’s correct. However, google adsense actually emails you and tells you that you are missing opportunities by not putting enough ads on your site! So, its a fine balance. Good and simple adsense layouts that can indeed help us increase our ctr even more..but recently i have read about a new project called WordAds and it comes directly from WordPress in order to help publishers earn more, even more from Adsense. The competition is a good thing, isn’t? Competition is always good. But I think this “WordAds” is only for WordPress.com blogs – not our self hosted WordPress blogs if I understand correctly. Good to see you sharing even more info. I also think 3 is a bit aggressive. 1,2 and 5 are excellent layouts. With respect to the 468×15 I’ve seen a few times googlers saying move that to a 728×60 BUT the reason they suggest that is so you can get image ads showing as well. IMHO that only works for some niches and is pretty ugly on occasions. Also in the #5 layout in the side bar are you using the wide skyscrapper (160 by 600)? Last question, do you have a current favourite layout at all? Thanks for this tips Spencer. This is EXACTLY what I was looking for ! Thanks again! how aboout 3 coloum template..
Thanx for your thoughts about ad placement! 1. In all ad placement examples you have an ad in the sidebar. Do you know a way in wordpress to exclude a certain page from displaying ads? It is easy to exclude a page in some adsense plugins – e.g. WhyDoWork (which I think you also mentioned in some post), but it only stop the ads from the content not from sidebar and not the link units under the navigation bar. I’ve read that there should’t be adsense ads on for example “Contact” page, especially if there is only contact form and no text. BTW is it true? 2. There was a question above about using different themes on different sites. You said that it is the way you do it. Is there a Google policy which say so or you just prefer to be safe than sorry? I thought that as long as the content is unique you’re fine. 2. I just prefer to be as safe as possible. Its not against any policies to use the same theme on all your sites. You asked about creating separate adsense codes for each website. The advantage of this would be that you will not only know which site a certain click comes from (as Spencer said you can get this data by looking at “Performance reports”>sites) but also which ad on this site got a click (“Performance reports”>ad units)). If you want to go even further, you can create and insert different ads on different pages of your site to have even more detailed info. BTW I see that you have a site about WP. Maybe you could also say something about excluding a certain page from displaying ads in sidebar (see my comment above). But I did do some searching and found this plugin (http://wordpress.org/extend/plugins/custom-sidebars/). I’ve never used it, but at a quick glance it seems like you could set up a sidebar with Adsense code and one without and then choose the appropriate sidebar depending on your page. Nice post Spencer. Also glad to see you updated LTP’s domain checker. Richard – I have to admit that I have only done Google search on 1 of my sites. I am not experienced in this area and have also known that I should be implementing this, but I just haven’t gotten around to it. When using the second layout, what WP theme are you using to create these sites in bulk? You know, I used to think that the theme and ad layout didn’t matter as much and that it was the particular niche that’s important. While I still think the niche makes the biggest difference…once you’ve selected that niche the theme and ad layout becomes crucial. Another thought that maybe Spencer can give some thought to…it does seem that when you change the theme/layout that, initially, your earnings will go down. My thought on this is that your site had been optimized for the previous theme/layout and it will take some time until AdSense can adjust for the changes. Justin: Great points. I agree that the niche and keyword play a major role, but you can certainly improve any keyword with proper theme/ad layouts. For your side units, what kind of dimensions do you use? And do you use text/image mix? Google was sending out some emails to people stating that a text/image mix will give them a better CPC and CTR. Don’t know if it is true for your case. My CTR has been around the same since switching…no noticeable difference. Depends on the theme. Could be 160×600, 300×250, or 250×250 or others. Text and image usually. Thanks, Spencer. Great post as usual. Layout 2 seems the best. I will give it a try on my next site. I have been playing around a lot with my adsense placement. I even switched the ads to not show preference based ads. I think next I will place box ad at the top right of my blog. Thanks for the layouts. I always use the in-content placement with justified insertion after the first paragraph. Partly due to wanting to be 100% in compliance with the Adsense TOS, partly because it converts well without putting the readers off. Have not been doing anything with the link bar under the menu. May give that a try. Is the ad layout on #3 called the double barrel ? I read somewhere that this worked really well for someone (he called it double barrel) but what theme would work with this? You can do this with just about any theme. Its just about ad placement, which is typically handled through a plugin. Thanks for response Spencer is this the Why Do Work Adsense plugin ? You can use the Why Do Work Adsense plugin, but I don’t think its around anymore. I now use the Quick Adsense plugin. But there are many others that will do the same thing. Hey Spencer, New Google update will penalize most of these layouts. My site got knocked from 5 on page one to page 20 and off the charts for all other keywords. Only had one ad block but Google doesn’t want things above the fold anymore it seems. Have your sites been effected? I think you are mistaken about ads above the fold. I doubt your site got penalized for the ad placement. More likely it was due to some other algorithm update. In fact, just today I got an email from Google adsense about one of my sites and they suggested ways I could be earning more. They included a screenshot from one of my sites and highlighted where I should place an ad to earn more money. You know where it was? Top left, above the fold. I have noticed no effects from any new google update. Unfortunately, you have probably been effected by Google, but its probably not related to ad placement…at least that’s my opinion. Here check out this link. This outlines what the update was. That’s great that your sites were not hit. My sites drop coincided with the update. All content is high quality and original. Slow dripped back links through UAW. I actually am hoping it was the ad placement, at least I can change that. Sad to say I had my best day so far with this site just the day before, about $5. Anyone else have issues? Maybe I’m just lucky. Either way just going to continue doing what I’ve been and hope it bounces back. Was not de-indexed so there’s hope. I spoke too soon! Yes, indeed I read the google blog update…just a little while after your comment. Looks like Google is cracking down on ads above the fold. Luckily, it says that “normal” ad placement above the fold is still okay. Which I would assume 1 ad above the fold is probably still okay. This is what the majority of my sites have. This could be an ongoing discussion and perhaps will need to do a blog post of my own in the future. Wanted to send you a Pvt msg of a screen shot of my site. I only had a link bar and large rectangle block. To the right of the block was a picture. This ended up pushing the content down on the page but not much. I had very low bounce rates and it surly didn’t qualify as excessive ads. I did a quick redesign, smaller ad block and moved pic lower on the page so much more content at top. Google already recrawled so now I must wait. Just an update: My site popped back to page one tonight for my main keyword. Other keywords bounced as well but not to where the were before. Will watch over the next few days if they continue to move up. I had contacted google directly and was told that my sites movement was prob due to an algorithm update. So that’s 10 days I believe for my site to bounce back from when they were slammed. I still don’t believe my site had excessive ads, but I guess that was what did it since my site is now back after reducing the ad size. Sry I didn’t post this in the post you have about the google update but seemed better to post it with the rest of my comments so there was context. Mike, that’s great to hear! When they say it was an “algorithm update” that very well could mean the top heavy ads algorithm update couldn’t it? So, perhaps what you did was what the algorithm was looking for. Glad your site came back! Great article again Spencer. I’m always looking for more clicks. I changed a few of my websites to the CTR theme. It significantly increased my revenue virtually over night. Well worth the money. Thanks for the great reference and actually sharing what works for you. I have gotten pretty good results with having the Large rectangle ad unit aligned left after about 1 paragraph or 200 characters of the post. It’s a community college website so it naturally isn’t that competitive, but I thought it might help. Thanks for writing and sharing such great information. I just changed my site to more of a site 2 layout, to see if it makes a difference and will continue to monitor and experiment. Thanks again. Simple Adsense! Lovely and simple, indeed. Awesome post! If you happen to read this, I’m curious as to how you feel about putting ads in the content itself, rather than on the sides/above/below. As an example, some news sites have their ads randomly placed between paragraphs. I have a question about loading performing adsense ad unit first. I have try to search around, but still no luck to get any info, not sure anyone in here able to help. Basically i have 3 ads in my blog, and i notice 300×250 is always the best performing ads. But this ad sequence is #2 from html stand point. Is there a way i can made this ad to load as the first in html? and my key point is, i load 300×250 after first image of my post, hence the position is not fix. I tried what is suggested by adsense blog, seems no luck. Hope some of you can help me out. In all examples sidebar is located on the right side? Would it be good if I put it on the left side? Yes, that would also be good. Thanks for the nice articles. Would layout 2 still be valid these days or would it be considered too aggressive by Google. I see the article was written in 2011 and wanted to confirm if layout 2 would be good to use in 2013. Hi Spencer – If you’re looking for a way to split test different adsense configurations, check out my wordpress plugin AmpedSense. I created it for niche sites exactly for this purpose. Thanks for another great post! 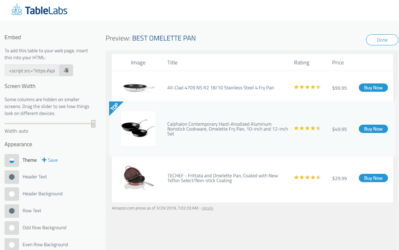 What about mobile devices – the adsense in the side bar is not visible in mobile phones as mobile devices don’t always show the side bar as their screen is not wide enough. I just wonder if you have a different setup today as this article is from 2 years ago. Can you suggest me some good wordpress plugin to put adsense in different position..?